When on April 10 1783 Hortense Eugénie Cécile de Beauharnais was born, nothing indicated the tumultuous future that lay ahead. This girl would become stepdaughter of the Emperor of France, Queen of Holland, and mother of Emperor Napoleon III. Her name would be slandered, and she would end up exiled from France. She spent her final years living in relative obscurity, far from the seats of power, where she could indulge her artistic talents. Who was this unknown first Queen of Holland? Hortense was the second child of Marquis Alexandre de Beauharnais (pictured at left with his family) and Rose Tascher de la Pagerie (later known as Josephine). Her parents did not meet until after their wedding contract had been signed by their families. Their first meeting took place in the port of Brest, where Rose arrived in France from her home in the French colony of Martinique. She was born and raised in Martinique by her parents, impoverished French nobles, and thus was considered a Creole. Creoles were looked down on in the Parisian salons during the reign of Louis XVI because of their lethargy, ignorance, and gaucheness. The marriage, not surprisingly, was a failure from the start. Alexandre never really warmed to his wife, and he even seemed somewhat embarrassed by her. After the birth of their son Eugène, Rose de Beauharnais became pregnant by a brief and loveless second 'embrace'. Alexandre refused to believe that he was the father of the small girl named Hortense, born on 10 April 1783, and demanded a divorce. Rose was required to withdraw into a convent, where she found herself in the company of women who had suffered the same fate. She stayed in the convent for 15 months, learning aristocratic manners from the other women there. After her divorce was settled, she went back to Martinique to live with her mother. She took her daughter Hortense (pictured at right) with her, but she had to leave her son Eugène in the care of his father and paternal grandparents. This separation must have been a traumatic experience for the two children, as they were each other's best friends. Thus, Hortense spent much of her childhood at the plantation of her grandmother on Martinique. With her curly blond hair and blue eyes, she was much admired by the black slaves, and she was delighted by their rhythmic dancing and songs. Here Hortense developed the talent to enjoy music and dancing in a free manner. Her stepfather Napoleon would later admire this quality and describe her as "nôtre Terpsichore." At the start of a slave insurrection, Rose and her daughter hastily escaped Martinique and sailed to Paris, where the French revolution had put an end to the reign of Louis XVI and Marie-Antoinette (both ended up on the scaffold). In the hell of the "terror," Hortense's noble father and mother were taken prisoner. Hortense and her brother Eugène were reduced to wandering through the streets of Paris, helped by their governess, the Belgian Countess de Lannoy. Alexandre de Beauharnais was one of many thousands who met their death under the guillotine. But shortly before Rose met the same fate, she was released from prison because of her contacts with the new regime that had overthrown Robespierre. Now, however, she was a widow with two small children, penniless and alone on the streets. To forget the horrors of the revolution and to enjoy herself as much as possible, the widow embraced Parisian society and quickly befriended some influential people. Hortense was sent off to a boarding school for girls, run by Madame Campan in Saint-Germain-en-Laye. Here she received an excellent education: she learned to make music and, besides the usual skills such as learning languages, took dancing and acting lessons. She received painting and drawing lessons from the famous Jean Baptiste Isabey. Hortense excelled in everything and was loved by everyone at school. But her mother had no time to admire her daughter. Rose used all her charms and the aristocratic manners learned from the ladies in the convent to get into the good graces of the new establishment. She dressed extravagantly, spared no expense in the decoration and furnishing of her rented house, and looked for rich lovers who could pay off her debts. One day she presented her daughter during a dinner party to an intensely pale Corsican general: Napoleon Bonaparte (pictured above with Josephine and Hortense). Hortense could not stand him and made no secret of her dislike. The 28-year-old general changed the name of his 32-year-old bride-to-be from Rose to Josephine, and from now on he made the decisions about their lives. Without informing Hortense and Eugène, the couple quickly married. While Napoleon was on a military expedition to Italy, where he gained one victory after another, he tried to get into his stepdaughter's good graces by presenting her with one present after another: perfumes, watches, jewels, and letters. But Hortense was still angry because Napoleon had stolen the heart of her mother and answered him in a cold tone. Napoléon wrote back: "I have received your friendly note ... you are a naughty, a very naughty little girl! ... and then, something which you know perfectly well, your mother can not be compared to any other woman in the world ... when it would be allowed to enlarge her happiness, I would consider it as one of my sweet duties, which I have now towards you. I will feel for you like a father and you will love me like your best friend." After these words Hortense slowly softened her attitude toward the general. Napoleon's star was rising quickly. He returned from Italy in triumph and quickly left again with his troops and went to Egypt. On his return to Paris in 1799 he staged a coup and overthrew the rule of the Directorate. He raised himself to be a Consul and later to be the First Consul of the French Republic. In this role he had almost royal powers. Josephine moved with Napoleon from their house on the Rue de la Victoire to the Palais du Luxembourg and later to the Tuileries. Much against her own will, Hortense was asked to come home from her school frequently, in order to attend lavish banquets, balls, and receptions. She became part of the sparkling company around Napoleon, which quickly took on the character of a royal court. The family of the First Consul spent their weekends at Château Malmaison. Mother and daughter became inseparable and endlessly discussed interior decorations, the garden layout, and purchases of artworks, all to enhance Malmaison. 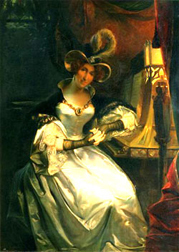 Josephine was insatiable in buying paintings by, among others, Girodet, Gérard, David, Isabey, and Gros. From the Italian sculptor Canova she bought elegant sculptures. She had fairy-like gardens made with glasshouses, in which she grew exotic flowers. To give Hortense the chance to develop her passion for the stage, Josephine had a theatre built where Hortense received applause for her ballets and her acting. Hortense also played the pianoforte and the harp. Later she arranged large court ballets at the Tuileries, which delighted Parisian society. When Hortense became old enough to marry, Josephine suggested that she marry Louis Bonaparte, the younger brother of Napoleon. In their children the blood of Napoleon and that of Josephine would be united. Josephine hoped to save her own position this way because she was unable to give her husband any children and was afraid that Napoleon might divorce her for that reason. Hortense was shocked; she was in love with somebody else and disliked the sombre Louis, who annoyed her with his eternal complaining. But Hortense was eager to please her mother and, against her own better judgement, married Louis Bonaparte. Louis was not attracted to Hortense either, but he also did what his elder brother wanted and went ahead with the marriage. In January 1802 the inescapable and unfortunate marriage took place. Nine months later Hortense gave birth to her first child, a boy; the child's step-grandfather decided that he would be named Napoleon Charles Bonaparte. Josephine rejoiced; her position at the side of the First Consul now seemed secure. 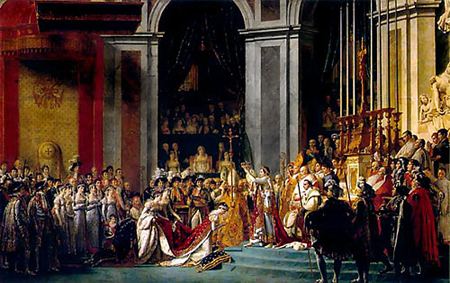 In December 1804 Napoleon and Josephine were crowned Emperor and Empress in the Nôtre Dame de Paris cathedral. Princess Hortense was present, wearing an empire-style dress sewn with diamonds. She held her son Napoleon Charles, heir to his uncle's throne. With an unstoppable hunger for glory, Napoleon planned to bring all of Europe under Bonaparte rule. Almost all the brothers and sisters of the Emperor got a crown somewhere in Europe. His younger brother Louis Bonaparte became King of Holland in 1806, and thus Hortense became Queen of Holland. 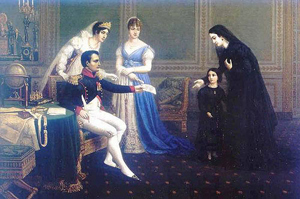 After the birth of their second son Napoleon Louis in October 1803, Hortense became desperate about this decision: "Do you really believe that he wants to send us to the Netherlands?" she wrote to her brother Eugène, "I cannot think about this without tears in my eyes. I will be unhappy, my God, so unhappy that I would die!" Did she have to abandon her mother, who could live no day without her? Napoleon ignored her complaints. In June 1806 the new queen had her first view of The Hague; the city was lavishly decorated for the occasion. Her husband was next to her in the carriage with the two princes on his lap. He called himself Lodewijk Napoleon from that moment on. The newspaper De Haagsche Courant reported: "the queen wore a brownish silk robe, her hair was decorated with diamonds and pearls." Hortense decided to make the most of being Queen. She told the pleasant Dutch Admiral VerHuell that she desired to be loved by the Dutchmen, so that they would make up for all that she had had to leave behind in France. Palace Huis ten Bosch, where the family decided to live, had been rather neglected. The interior reminded Hortense of the House of Orange, whose stadholders had lived in the palace until 1795; the wall paintings in the ballroom still told stories about acts of heroism by the stadholders of that House. The king immediately ordered expensive redecorations to his home. He also worked with indefatigable zeal for the restoration of his kingdom. During the limited time that he ruled, he made large improvements in many areas. As a result, the people started to love their king. And Lodewijk loved Holland, which became his only love. He regarded his marriage as a disaster. With his morbidly jealous nature, he encouraged people to spy on his wife, opened her letters, and forbade her to dance during court balls. Hortense was no longer allowed to play the piano in public and lived as a virtual prisoner in her apartments. Shortly before their official visit to the city of Rotterdam, they had a fierce fight at home. In this mood they had to travel to Rotterdam together on 2 July 1806, where a festive reception had been prepared. Hortense showed her surprise about the festive welcome she received: "it was the same everywhere," she wrote in her memoirs, "the change makes people joyful, they expect good fortune from the new." During the stormy night of 4-5 May 1807, Hortense would suffer the greatest blow of her life: her eldest son (pictured below with his mother) died from an illness at Huis ten Bosch. Hortense was in shock and left for France, where she suffered from depression and grief. In a spa in the French Pyrenees, Hortense tried to regain some of her strength. She went for exhausting mountain walks and climbed to the highest mountaintops to be closer to her child in heaven. The king made one last attempt to save his marriage. He went to France and met his wife in Toulon. There a short reconciliation took place in an inn, as a result of which Hortense became pregnant for a third time; however, Lodewijk never believed that this child was his. In Holland, where everybody was informed about the bad state of the marriage, the rumour spread that Admiral VerHuell had fathered the child. Although VerHuell had not left The Hague for a year, Lodewijk started to believe these rumours himself. He returned alone to his kingdom. The Hague no longer pleased him so he decided to settle in Utrecht, where he demolished a large number of houses to build a new royal palace. This expensive project was hardly finished when he changed his mind again and decided to make Amsterdam the capital of The Netherlands and to make the town hall on Dam Square his palace. Many people tried to discourage the King with reasonable arguments: the building from the Dutch golden age was ice-cold, due to its enormous marble halls, and totally unfit to live in. The headstrong King Lodewijk, however, refused to listen and ordered masons, carpenters, furniture makers, etc., to start working. Meanwhile Napoleon decided that he had to separate from Josephine in the interests of France. The annulment ceremony took place in December 1809 in Paris, amid great rejoicing by Napoleon's family who disliked Josephine intensely. The Emperor quickly married the eldest daughter of the Emperor of Austria, Archduchess Marie Louise, who gave him a son. Napoleon, who still considered and treated Hortense as his daughter, ordered her to return to the Netherlands where she should reconcile with her husband. Unhappy, she travelled to Utrecht with her second son Napoleon Louis. Her youngest son Louis Napoleon was left behind with his grandmother in Paris. In her apartments along the Drift canal in Utrecht, Hortense led an isolated life. During a military parade on the inner court of the palace, she showed herself to the public, who responded with shouts of joy (a reason for the jealous Lodewijk to keep his wife even more isolated from the public). During the Holy Mass in the court chapel with its brand-new church silver and its superb choirs, Hortense was touched deeply, and she often went there to pray for her dead son. After Easter in 1810, however, the King decided to move with his family to the new capital, Amsterdam. During the ceremonial entrance into Amsterdam, the Queen was so weak that citizens who saw her in the coach called her "Reine misérable! Nôtre pauvre reine!" Her appearance astonished everyone. People had heard that the Queen led a frivolous life in Paris, but her looks did not fit the picture of a frivolous woman. "The palace in Amsterdam is a former town hall and had a very beautiful interior," Hortense wrote in her memoirs, "The king had done everything possible to beautify it but still, one could not imagine a sadder place to live (...) my Dutch ladies in waiting seemed very nice but I hardly knew them; most of them were new. Therefore I spent my days reading alone in my apartments. One usually warned me late in the afternoon that the king expected me at his table; I went. During the meal he didn't speak a word to me. After the meal the king let his fingers wander over the piano. He put his son on his lap, cuddled him, took him along on the balcony which looked out on the square. Whenever the people saw them, cheers would arise. Then the king came back in, and seated himself behind the piano where he recited some French songs or hummed a melody. I was seated on a chair, only looking at the things that happened in the room, without saying a word. I withdrew myself at 9 o'clock after I had wished him a good night. Those were the only words we exchanged." After some weeks Hortense became so ill that people feared for her life. In summer 1810 she asked the king for permission to visit Palace Het Loo in Apeldoorn. He agreed reluctantly but kept his son in Amsterdam. After a short stay at Het Loo, Hortense left to take the waters in Plombières. She would never see The Netherlands again. Under pressure from Napoleon, her husband abdicated a month later at Pavilion Welgelegen in Haarlem and appointed his eldest surviving son to be the next king: Lodewijk Napoleon II. The five-year-old boy ruled for two weeks. His uncle Emperor Napoleon brought him to Paris and annexed Holland into the French Empire. Napoleon now experienced his first defeats. The battles in Russia in 1812 ended in a humanitarian catastrophe, and during a battle near Leipzig his troops suffered a devastating defeat. As a result of these defeats, the Emperor was exiled to the island of Elba. The Bourbons were restored to power, while the Bonapartes disappeared. Hortense and her mother retreated to Malmaison, where they received Tsar Alexander I several times. The Tsar befriended the two women and Hortense's brother Eugène and made sure that they were treated well by the new regime. Josephine was allowed to keep Malmaison, and Hortense received the title Duchess of Saint-Leu from King Louis XVIII. During this period Hortense was finally able to leave her husband. The couple separated and underwent a humiliating public court trial about the custody of their two sons. During this period Hortense started her relationship with the officer Charles de Flahaut, an illegitimate son of the French statesman Talleyrand. After 10 months Napoleon escaped from Elba and reclaimed his imperial throne. On his return to Paris nothing was the same any more: Empress Marie Louise had left France with their son, the King of Rome. Josephine had died at Château Malmaison. During the hundred days of his return, Hortense assisted her stepfather as an "empress". She was one of the very few who continued to support him until the last moment. When Napoleon wanted to escape to America after the Battle of Waterloo, he was captured by the English and sent into exile on the island of St. Helena, where he died in 1821. 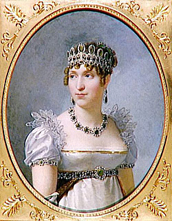 Hortense had to leave Paris within two hours after the fall of Napoleon, as her loyalty to the him was not tolerated any longer, even by Tsar Alexander I who had been so supportive of her in the past. Hortense had been treated kindly after Napoleon's first defeat; she was in the good graces of Emperor Alexander I of Russia, and even the new Bourbon King seemed to like her. However, they could not forgive her for sticking by her stepfather upon his return from Elba, and consequently she had to leave France. She escaped with both her sons to Switzerland and eventually ended up near the Bodensee close to Konstanz. There she bought a small castle on a cliff overlooking the lake: Schloss Arenenberg. To complicate matters further, by the time of her exile she was pregnant. As she had not seen her husband for some years, this pregnancy would cause a scandal.The father of her illegitimate child was Charles de Flahaut; their child was born in Switzerland and was named Charles after his father. He was taken to France, where he was raised by his father and paternal grandmother. This last son of hers, Charles de Morny, would later be created a duke by his half-brother Napoleon III and would become one of France's most important statesmen during the Second Empire. In exile Hortense started to write her extensive memoirs. She composed music and published her romances; she created drawings and paintings. Her house became a center of French culture. Established artists were fascinated by her and paid visits to the exiled Queen in Switzerland. Franz Liszt played on her piano, the young writer Alexandre Dumas listened when she sang his favourite romance, and the poet Lord Byron came and stayed with her. From her base in Switzerland she travelled extensively, often to Italy where her second son, Napoleon-Louis, lived with his father. Hortense doted on her two sons, and she was very worried when they took part in the Italian revolt against Austrian rule in 1831. During this episode Napoleon-Louis died and Louis Napoleon had to flee. His mother helped him to escape to Paris. She would continue to be worried about her son's political activities, especially when he tried to stage a coup in France in 1836, which failed. A year later, in 1837, the legendary "Reine de Hollande" died from cancer; she was 54 years old. The Dutch newspapers dedicated only three sentences to her death and funeral. According to her last wishes, her remains were transported from Arenenberg to the church of Rueil near Malmaison, where she was burried beside her beloved mother, Josephine. Her youngest legitimate son inherited the ambition and strength of the Bonapartes and returned to Paris after the rule of the Bourbons (Orleans), where he became Emperor Napoleon III. As a national hymn he chose of the most popular romances composed by his mother Hortense de Beauharnais: "Partir pour la Syrie." de Beauharnais, Hortense. Mémoires de la reine Hortense, 2 volumes (Paris 1832, 1835). Coppens, Thera, Hortense, de vergeten koningin van Holland (Amsterdam 2006). Taylor, Ida A. Queen Hortense and her friends, 1783-1837, 2 volumes (London 1907). Wagener, Françoise. La Reine Hortense (Paris 1992). Wright, Constance. 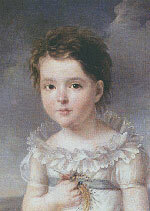 Daughter to Napoleon. A biography of Hortense, Queen of Holland (London 1962).